Roswell’s motto is “Modern Spirit. Southern Soul,” and this perfectly represents what the city is all about. Roswell enjoys the slow-paced, easy living atmosphere the south is so well known for, but at the same time, it’s an exciting and vibrant city that fully embraces all of the conveniences that modern life has to offer. It’s also one of Georgia’s fastest-growing cities; in fact, Roswell is so popular that it is now the eighth-largest city in the state. In Roswell, 67 percent of people own their homes, versus 33 percent who rent. The median home value in Roswell is $333,200, which is considerably higher than the national average of $184,700. Rent is also more expensive in Roswell, averaging $1,152 compared to $949 nationally. The most popular home styles here are the contemporary, ranch, farmhouse, and Greek Revival. Roswell is a historic city that has yet to reach its full potential. More and more people are moving here every day, whether to raise a family, to find a job, or to retire. It’s a safe and friendly city that maintains its small-town southern hospitality, despite embracing modern amenities and conveniences. If there’s one city that truly offers the best of both worlds, it’s Roswell. Roswell is served by three MARTA bus routes: Routes 85, 185, and 142. It also has several major roadways that travel through or near it, including State Routes 9, 92, 120, 140, and 400. This type of ease of access makes commuting by car the most common type of travel among its residents. Roswell is also a great place to live if you like to get around by foot or on bike. It has several walking/biking trails, including the Big Creek Greenway, the Roswell Riverwalk Trail, and the Vickery Creek Trail. There’s also the new PATH400 Greenway Trail that is currently under construction. When completed, this trail will traverse the cities of Atlanta, Sandy Springs, and Dunwoody and travel through Roswell. Roswell’s population is very educated with 56 percemt having earned at least their bachelor’s degrees. The city has a 50-50 mix of men and women, and it is a racially-diverse community where Whites, Hispanics, and African-Americans make up the three largest portions of the population. Roswell is a city that is attractive to all age groups, but it is especially favored by families with children and middle-age and older adults. Children ages 17 and under account for 25 percent of its population, and adults aged 55 and over account for another 25 percent. However, the largest individual age group is adults aged 35 to 54, which makes up 30 percent of the population in Roswell. 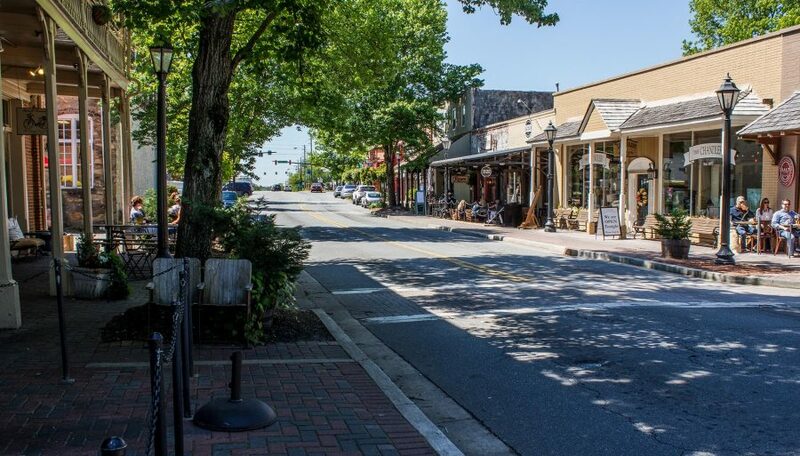 Financially, Roswell is an affluent community where the median household income is $87,911, which is much higher than the national average of $55,322. In fact, 26 percent of households earn $150k or more. As for the median individual income, Roswell comes in at $38,536 compared to $27,419 nationally. Nearly one-third (32 percent) of Roswell’s working adults earn at least $65K a year. Roswell also has a considerably lower unemployment rate than the national average: 2.6 percent compared to 3.8 percent. Roswell enjoys one of the hottest dining and nightlife scenes among all of Atlanta’s suburbs. There’s a restaurant for just about everyone’s tastes, and the experiences range from exquisite fine dining to quick and affordable eats. If you’re looking for a five-star dining experience in Roswell, you’ll have plenty of places to consider. For instance, Osteria Mattone is a favorite for elegantly prepared Italian food, while both Little Alley Steak and Stoney River Steakhouse and Grill reliably offer two of the best steakhouse menus in Roswell. If you want French delicacies, then Bistro VG is the place to go, or if you want to try one of the Atlanta area’s best farm-to-table restaurants, you’ll want to go to Table & Main. For the best cheap eats in Roswell, you’ll have your pick of Greek/Mediterranean food from Athens Greek Restaurant, pho and Asian specialties at Pho and Com Asian Grill, Mexican food at El Torero, and pizza at Big Pie in the Sky Pizzeria just to name a few of the outstanding options. If you love going out after work or on the weekends, then Roswell won’t disappoint. Cordell’s Restaurant Bar & Nightlife has everything from hookah to dancing, while Tap & Six provides a comfortable atmosphere for enjoying one of the area’s best selection of brews. The Whiskey Project has an excellent menu and an incredible wall of whiskey, and The Gaslight is one of the best places for cocktails and live music. Art plays a large role in Roswell residents’ quality of life. The city has several galleries to choose from, including the Ann Jackson Gallery, the SLM Studio Gallery, the Clay Collective at Roswell Art Center West, the Taylor Kinzel Gallery, Wild Hope Art Gallery, and many others. Roswell is also rich in the performing arts with it being home to the Atlanta Baroque Orchestra, Red Door Playhouse, the Georgia Ensemble Theatre, and The Michael O’Neal Singers. Roswell features plenty of historical sites, such as the photogenic Roswell Mills and Old Mill Park, historic Roswell Town Square, the 1853 Machine Shop, Primrose Cottage, Kimball Hall, Canton Street, and more. As if all that isn’t enough, Roswell also sits on the edge of the Chattahoochee River, which offers a variety of water sports and outdoor recreation opportunities. There’s a dog park at Leita Thompson Memorial Park, and the Serenity Garden at Roswell Area Park is the ultimate place to go to relax and reflect. Roswell is a great place to retire to because it has so many things for older adults to enjoy, from the parks to the historic sites to the programs and events offered at the Roswell Senior Center. Monday through Friday, seniors can take part in a wide variety of fun and exciting activities at the senior center, including card games, bingo, exercise classes, brain games, arts, creative writing, and more. The center is dedicated to helping Roswell’s older community maintain their independence, mobility, and health. Roswell also has all the medical services today’s seniors need or will need. Roswell is just a few minutes’ drive from WellStar North Fulton Hospital, St. Joseph’s Hospital of Atlanta, WellStar Pulmonary Medicine, and more. Considering a new home in the "Big Peach?" Sign up for FREE home trends updates delivered straight to your inbox!